Thorntons is to launch two block tablet bars into the competitive UK chocolate market in October, in a move that it claims heralds an "exciting new phase" in the brand's development. The chocolate brand is adding two 100g bars, Fudge Chocolate Bar and Special Toffee Milk Chocolate – to tap into the £3.9bn chocolate market and take a bite out of the £584m block category, currently dominated by Cadbury and Mars' Galaxy brand. Initially sold in convenience stores, the launch will be supported by an interactive "Too good to share?" social media campaign with "significant" BTL launch activity. "This launch will catapult Thorntons into an exciting new area of the market", said commercial director, Phil Sargison. "We expect strong sales from these new products, driven by our fans' loyalty to one of their favourite British chocolate brands and their love of the great taste of Thorntons." He claimed that "extensive research" showed that the concept of a Thorntons block product was both "exciting and appealing to our shoppers" and that chocolate lovers would purchase the bar in addition to their current favourite products. 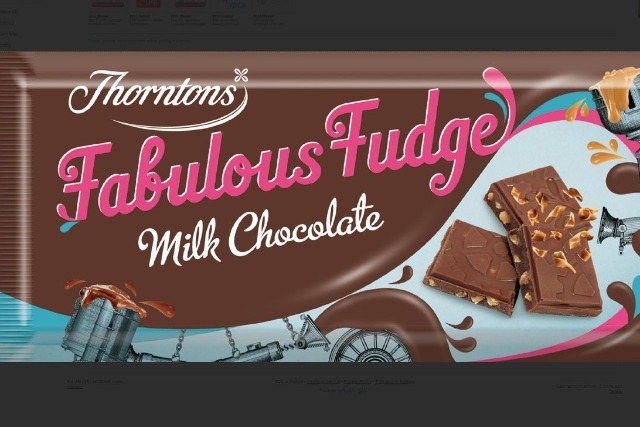 Thorntons Fabulous Fudge Milk Chocolate and Thorntons Special Toffee Milk Chocolate will both be priced at £1.59 for a 100g bar.